This maxi dress is dramatic and ethereal with beautiful fabric details at the bust. The Rosemary Pleated Chiffon Maxi Dress is lined at the bust but has semi-sheer panels of mesh fabric below at the waist. This dress is made of pleated chiffon in a unique crisscross pattern at the top. Adjustable spaghetti straps allow you to control the fit. The attached skirt is made of semi-sheer chiffon and is lined to the mid-thigh. A hidden back zipper completes this dress. The Rosemary Pleated Chiffon Maxi Dress would make a cute prom dress or dress for any other formal event. It would also be perfect to wear on vacation somewhere warm. You can dress it up with strappy heels and a clutch. Or wear it more casually with flat beaded sandals. This is a really cute summer dress with pretty details. Details: Lined and lightly padded bust. Adjustable spaghetti straps. Skirt is lined to mid-thigh. Hidden back zipper. 60% silk, 40% polyester. Lining: 100% polyester. Hand wash cold water separately. Color will bleed. No bleach. Hang to dry. Small measurements: Length from top of bust to hemline: 52". Bust: 32". You have added Rosemary Pleated Chiffon Maxi Dress in Ivory into Wishlist. You have added Rosemary Pleated Chiffon Maxi Dress in Ivory for Stock Notification. 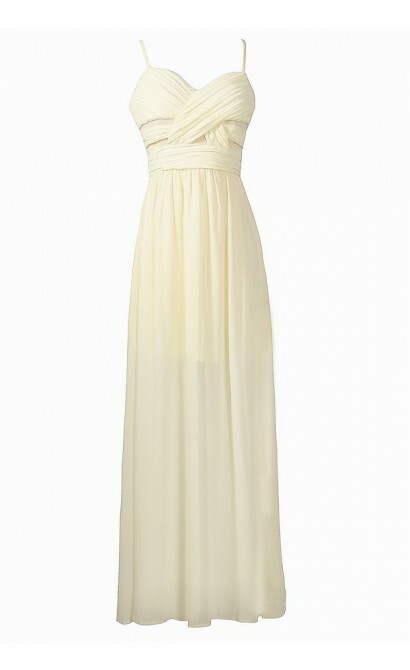 You have set Rosemary Pleated Chiffon Maxi Dress in Ivory as a loved product. You have removed Rosemary Pleated Chiffon Maxi Dress in Ivory as a loved product.